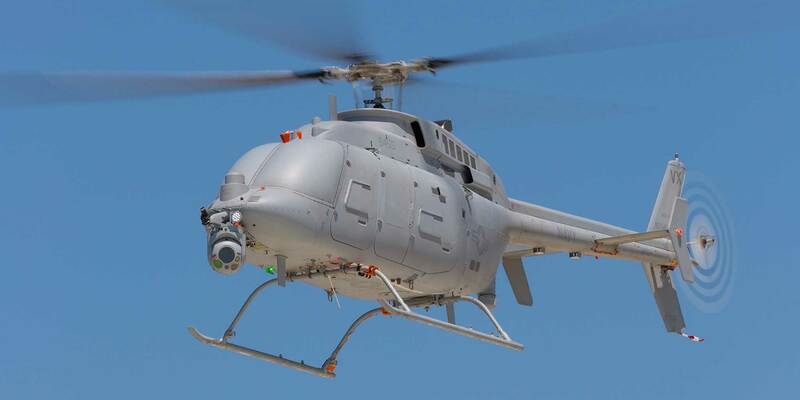 The Bell 407-based MQ-8C uses control systems similar to the smaller MQ-8B. Northrop Grumman’s MQ-8C Fire Scout is advancing towards an early operational capability planned for the end of next year. T﻿he Fire Scout development team is currently focusing on the integration of two key capabilities to the air vehicle. Firstly, the Leonardo Osprey 30 AESA multi-mode radar is being added, with flight trials expected to get under way this fall. The lightweight Osprey comprises two AESA arrays that are mounted either side of the nose, providing a very wide sector coverage. It is also being equipped with Link 16 datalink to improve interoperability and its ability to perform targeting for shipborne weapon systems. In the meantime, the MQ-8C has recently completed its first initial operational test and evaluation campaign. The assessment, which was undertaken off southern California by VX-1 aboard USS Coronado and completed on June 29, included joint MQ-8C/MH-60S missions. Pier-side testing continues this month aboard Coronado, with the focus on cyber and maintenance. The MQ-8C first undertook shipborne operations in December 2014. Based on the commercial Bell 407 helicopter platform, the MQ-8C is intended to provide an unmanned intelligence, surveillance, reconnaissance capability to the U.S. Navy's Littoral Combat Ships, including cooperative operations with manned Sikorsky MH-60S helicopters. Initial operational capability is slated for 2020. In operations, the MQ-8C usually flies at around 4,877 meters (16,000 feet), and in a typical mission fit can remain aloft for 12 hours. With a line-of-sight datalink, the MQ-8C can operate at around 161 km (100 miles) from the parent vessel, while its radar provides another 161 km (100 miles) of detection range against surface targets. Northrop Grumman is promoting the Fire Scout to a number of nations, recognizing that there is considerable interest in shipborne UAVs that can be paired with manned shipborne helicopters. Japan’s Maritime Self-Defense Force is studying options, and there is also interest from the UK. A development that could raise interest further is the proposal to give the Fire Scout an anti-submarine warfare capability. Ultra Electronics has devised a Sonobuoy Mission Pod that would allow the MQ-8C to sow buoys and, as an option, receive and process data from them.